While some might tell you otherwise, you’re never too old to straighten out your teeth. Even in a person’s later years, the procedures for adult orthodontics remain a surefire way to reposition your teeth. Doing so can also relieve them of any number of maladies, such as malocclusion (a bad bite). Treating misaligned teeth can resolve any number of issues. Your smile is a hallmark of who you are. Knowing it shines out is vital to your self-confidence. Just as importantly, correctly aligned teeth are much easier to properly clean. Teeth that are simple to clean will allow you to fight harder against tooth decay and periodontal (gum) disease. As the risks of both diseases increase with age, it is even more important for older Americans to receive the proper treatment. Lastly, chewing your favorite foods is much easier to do when your teeth are good and straight. Your overall dental health, rather than your age, is what truly determines if you should see an orthodontist. Because ailments like gum disease can make treatment complicated, it’s crucial that you see your general dentist for a complete oral examination. This will allow him/her to address any issues with decay or gum disease prior to starting orthodontic treatment. If you are a candidate for orthodontics, we will need to determine the best treatment option for you. This often depends on the sort of malocclusion you have, and how it affects your teeth coming together. Many options are available today including Invisalign which is a very popular option for teens and adults self-conscious about wearing braces. Tailored to individual patients, these clear plastic aligners can barely be seen by the naked eye. 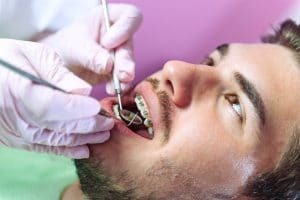 If a skeletal jaw growth issue is the cause of the orthodontic problem, in rare instances, orthognathic surgery may also be indicated with the use of traditional braces. Once we’ve completed any and all orthodontic procedures, a retainer will be necessary to stop your teeth from going back to their original places. Dr. Oles Drobocky at Drobocky Orthodontics strongly recommends that their patients wear their retainers either every night or at least a few nights a week after orthodontic treatment is completed. Doing so will minimize the chances of the teeth moving over time. While some consider the ongoing use of a retainer to be an annoyance, most agree it is well worth the price of ensuring your teeth stay healthy and your smile stays bright. For more information about adult orthodontics and whether or not you are a candidate for Invisalign or traditional braces, please contact our Bowling Green, Glasgow or Franklin KY office for a complimentary new patient evaluation. There is no better time than now to create a beautiful new smile. Don’t wait… call today!